This mod is a update to Ultimatecoffee's original mod. This update was uploaded separately with his permission. Please endorse that mod in addition to this one. • Makes all settlers from Settlers of the Commonwealth available as City Leaders in Sim Settlements. • Settlers are neutral. They do not have any bonuses or penalties as City Leaders. Settlers now have traits! I've carefully gone through their idle dialogue and gave them (what I hope is) matching traits. • Install with your favorite mod manager or simply copy the files into your Data folder if you prefer. 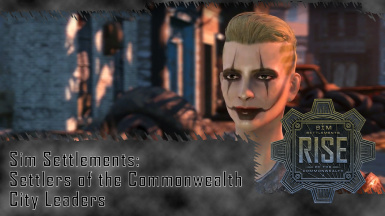 • Sim Settlements: Settlers of the Commonwealth - City Leaders creates all new records. It shouldn't conflict with anything. • Requires Sim Settlements and Settlers of the Commonwealth to be installed. • Disable 3DNPC_FO4Settler_SimSettlements.esp. I do not suggest disabling or removing any mod mid-playthrough. • Ultimatecoffee - The original version of this addon.